TVS has launched Jupiter Grande 2018 to rival Honda Activa 5G. Let’s check its specification, features, and price. The two-wheeler manufacturer has upgraded its most selling scooter keeping in mind the requirements which are now needed. When TVS Jupiter was first launched, it shooked the scooter market and its segment. 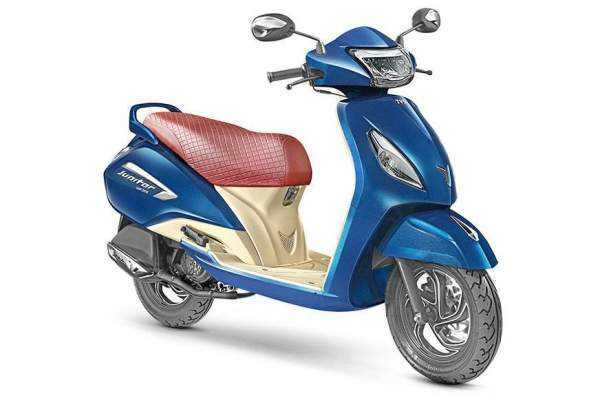 It became the second most selling scooter in India after Honda Activa. Let us get straight down to what TVS has improved in its existing Jupiter model and what it will be offering to its customers. Yes, TVS has added some new features and modified its name by adding ‘Grande’ to its back. In the new variant, the company has added semi-digital instrument console, led headlights with position lamp, new color scheme, and chrome in a huge quantity. In terms of its looks/visual appeal, it looks similar to its parent variant. But now, the customers will get part-analog-part-digital instrument console which includes trip meter, clock, digital fuel meter, service reminder, and some other features. 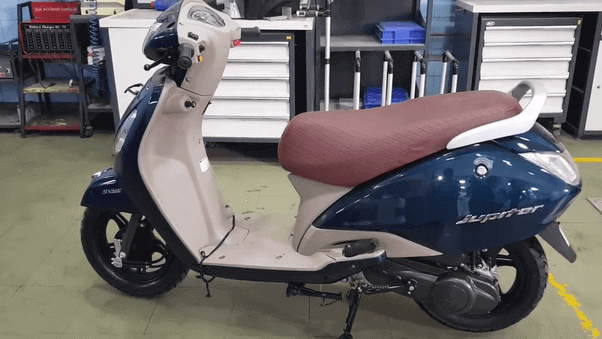 2018 TVS Jupiter Grande 2018 will arrive donned in Starlight Blue Boday color. It will sport a premium looking cross-stitched maroon seat. The base variant has a better seat than the disc brake variant. The classic model offers better seating comfort to the rider. Footboard has been put in contrast with the body color using beige color. The handlebar and front apron will be almost same as of the previous Jupiter classic model. Chrome has been used in huge quantity to give Jupiter Grande a premium visual appeal. The new version comes with 17-litres of boot space and it will come with a mobile phone charger setup as an option. 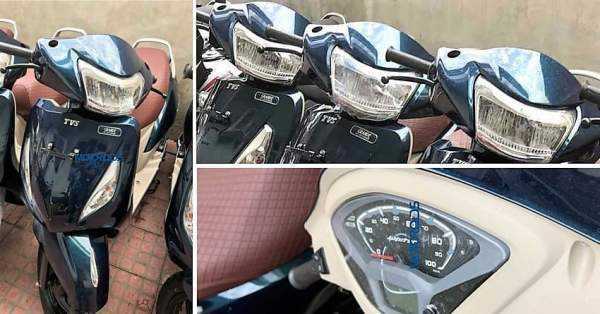 Besides above features, it will feature reserve fuel indicator, eco/power mode, parking brake, pass switch, led tail lights, body colored pillion grab rails, and a ‘Grande’ badge on the front. There isn’t any mechanical change in the new Jupiter 2018 launch. It comes with the same 109.7cc single cylinder air cooled engine with the automatic CVT transmission. It will produce 8hp of power and 8Nm of torque. TVS claims that Jupiter Grande will deliver 62km/l of mileage. But, in reality, it won’t as it all depends on the rider’s driving habits/style and real-world roads’ conditions. However, we can expect 50+ kmpl on road. Just like other companies, TVS is also targetting the upcoming festive season. Let’s see if TVS motors will come forward with some amazing offers. Coming to the wheels, the new TVS scooter features 12-inch diamond cut alloy wheels in the disc brake variant while normal alloys wheels with the drum brake variant. In the front, it has telescopic suspension while gas-charged monoshock is present at the rear. Both are independently adjustable. Apart from it, the new TVS Jupiter Grande will have both tubeless tyres, sync braking system, external fuel filling, and two retractable bag hooks, 5-liters of tank capacity, 150mm of ground clearance which is decent, 765mm of seat height. The engine is quick and can reach 0-60km per hour in 11 to 12 seconds. The main competitors of Jupiter Grande 2018 will be Honda Activa 5G, Hero Duet, Yamaha Fascino, Yamaha Alpha, and Hero Maestro Edge. As far as price is concerned, TVS Jupiter Grande comes with two variants. One is priced at Rs. 55,936 (ex-showroom Delhi) and the other costs Rs. 59,648 (ex-showroom Delhi). The new models have reached to most of the dealerships. It is already available for booking. You can book one by paying Rs. 5000 front. Deliveries are expected to start within a week.